The Art Institute of Chicago, located in the heart of Chicago, is a venue offering diversity with a choice of historic or modern event spaces. 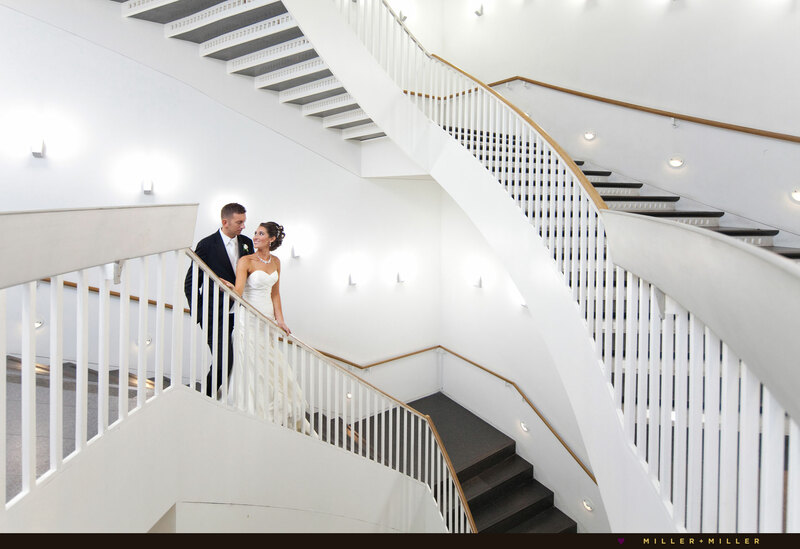 Equally impressive, both the new and old sections of the museum are fabulous for wedding photography and fitting for both a modern chic or classic Chicago bride’s wedding event style she desires. 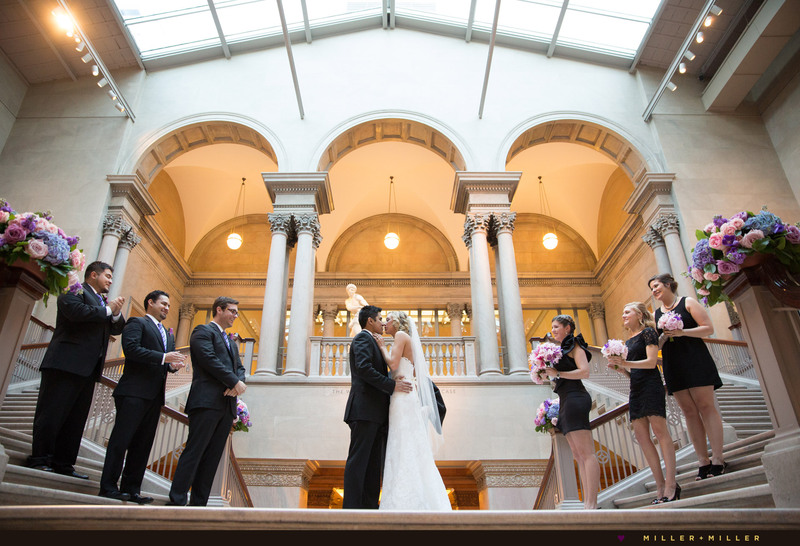 Undoubtedly the Art Institute of Chicago is a popular choice for a bride and groom who are art lovers. Share your love of art with your new spouse and guests by enjoying a private art museum gallery walk and viewing famous paintings and art of Degas, Monet, Renoir, and other fine artists on your wedding day. 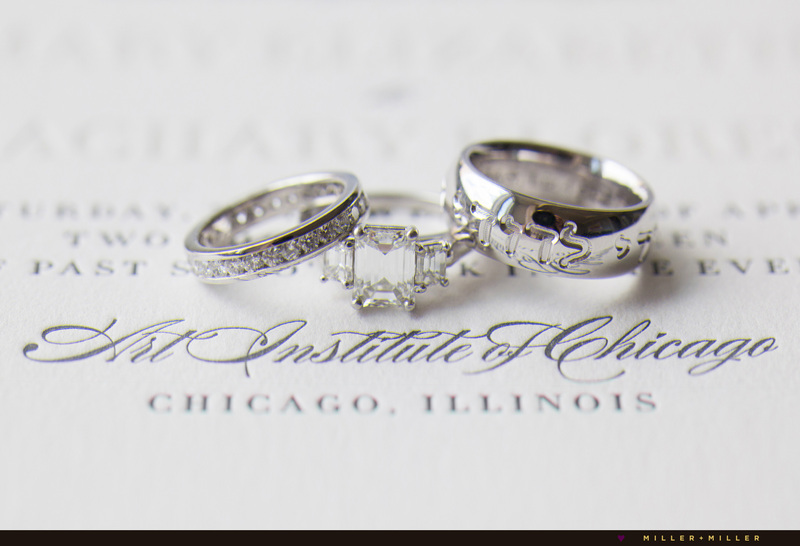 Established in 1879, the historical section of The Art Institute of Chicago offers a historically classic Chicago wedding look. After all, Chicago’s Art Institute is one of the oldest museums in the United States and the building remains an icon for Chicago’s famous Beaux-Arts classical architecture. In 2009, the Art Institute expansion opened the doors of the Modern Wing with new galleries and various event rooms from smaller intimate weddings to large scale events. 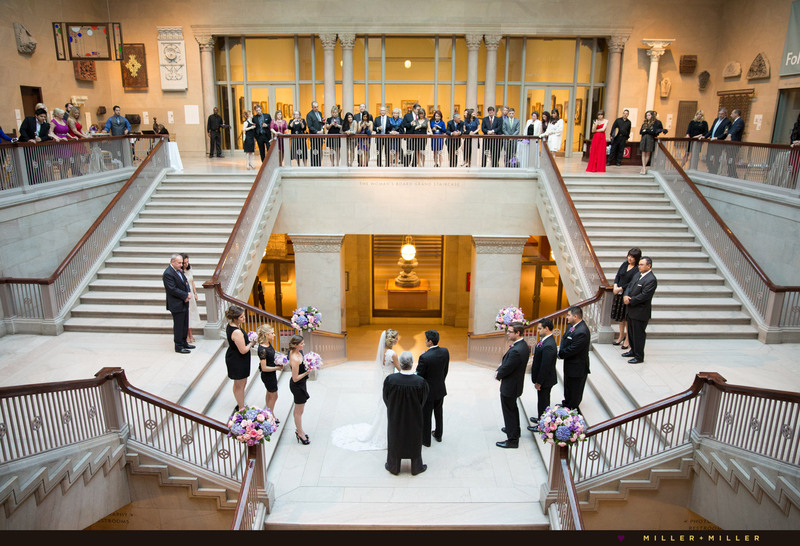 Centrally located, we love The Art Institute as a wedding venue due to its fabulous Chicago location steps from Michigan Avenue, often minimizing transportation needs. With a location offering a variety of wedding photography locations at and new the Art Institute, we love taking advantage of private skyline views from the gorgeous terraces, editorial style wedding photography portraits and option within the two diverse architectural styled sections of the museum, and photos at nearby spots outside at Millennium Park, or the adjoining Art Institute’s lush gardens and fountains. Looking to go more modern or historically classical? 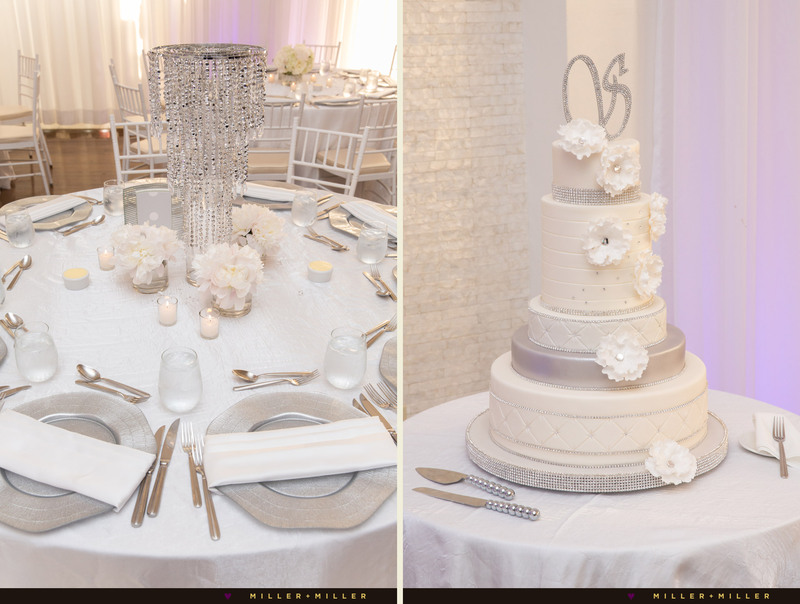 Brides are able to choose from several diverse wedding event rooms and spaces at Chicago’s Art Institute fitting to the preference and unique style of their wedding day. After learning which part of the museum our bride’s chooses, we work together to choose photo locations to fit your wedding style. We especially love the museum’s three staircases, a modern or historic staircase. Will you choose the modern glass staircase at Griff Court, or the limestone classical romantic staircase in the Women’s Board Grand Staircase. 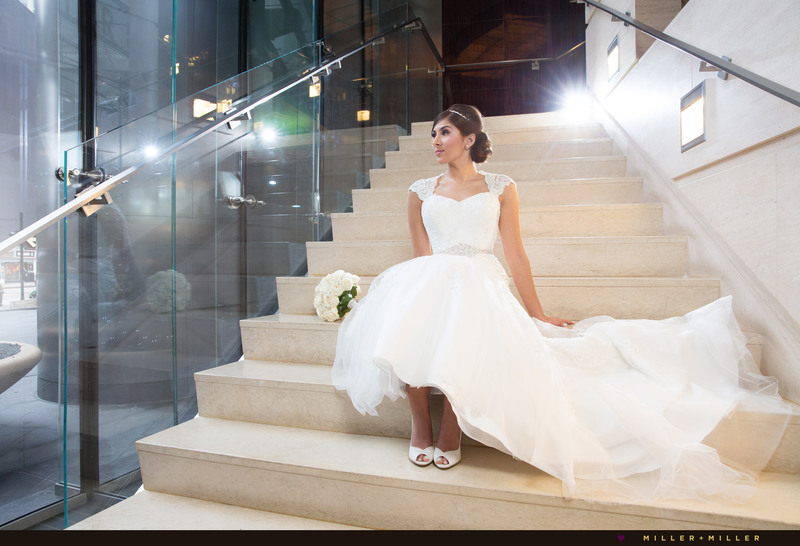 Or choose to take in Chicago’s impressive views opting for one of the Modern Wing’s ballrooms and or Bluhm terrace overlooking the magnificent Chicago skyline – amazing views, awesome for wedding photos and pictures. If your recently engaged and haven’t booked your venue yet… a tour of all the event spaces is a must. The Art Institute hosts events of all kinds and sizes whether an indoor seated dinner or an outdoor alfresco affair. 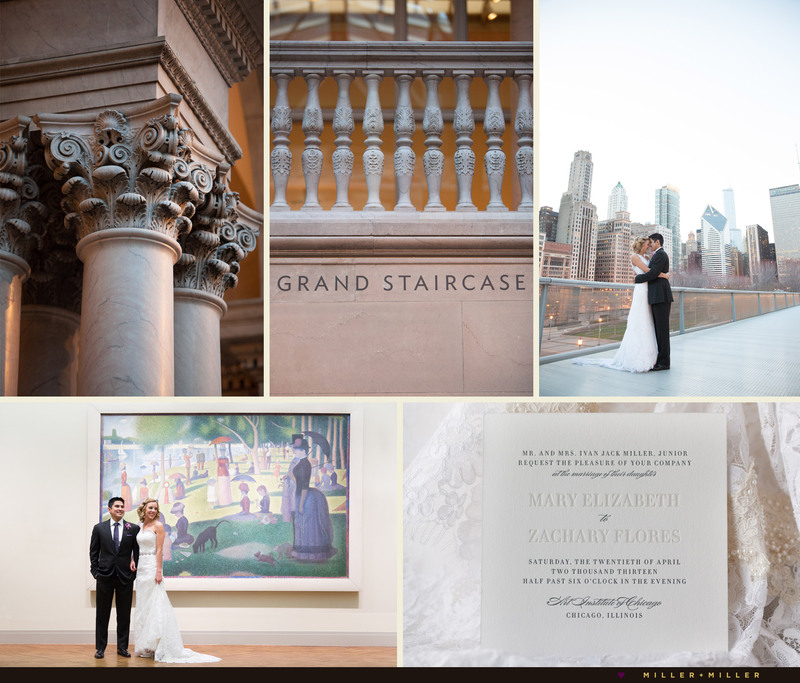 Above is a brief photo tour of the spaces and below are a few quick highlights about each of the Art Institute of Chicago’s spaces to choose from when planning your special event and considering wedding photography for your day. 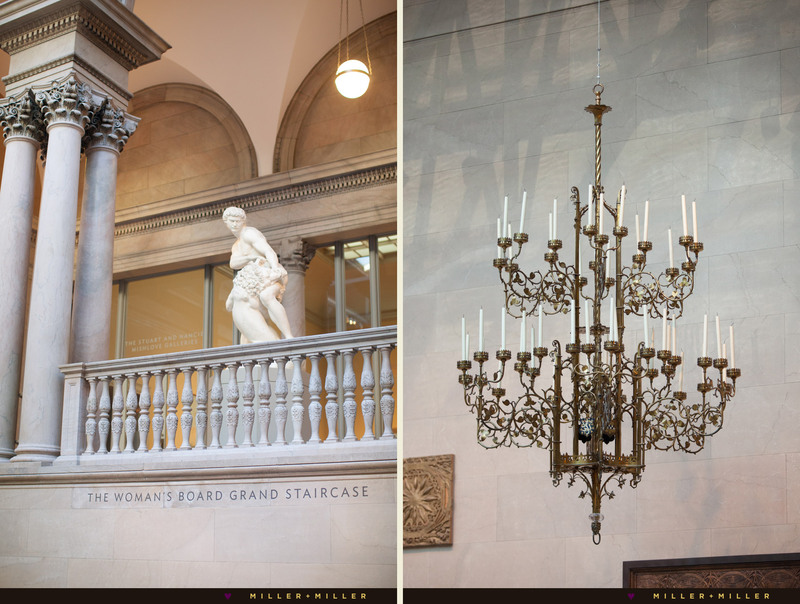 Women’s Board Grand Staircase is an iconic location for a ceremony at The Art Institute of Chicago. Within the historical section the art museum, the room provides for unforgettable ceremonies where guests stand by to watch a bride and groom exchange vows under a three-story cathedral ceiling with skylight. A room with design influences of Greece and Rome, the grand staircase room showcases Corinthian columns, limestone, and classical Beaux Arts style of Chicago’s architecture. Chicago Stock Exchange Trading Room is a large ballroom with classical revival style architectural room design featuring ornamental pieces from the original the historical landmark Stock Exchange Chicago which features stenciled decorations, molded plaster capitals, and art glass preserved from the original Trading Room. We love outdoor wedding venue options in Chicago and if you’re looking for serenity in the city consider McKinlock Court. The Art Institute calls it is a hidden secret. This is an exceptional outdoor courtyard, with fountain and is encircled by museum galleries, creating a completely exclusive and intimate experience. 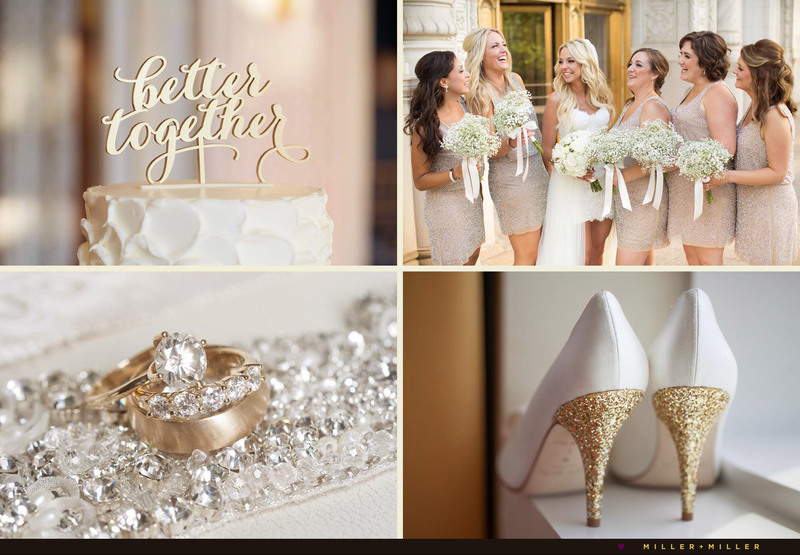 A choice to consider if you want your entire outdoor Chicago wedding events outside, or your romantic ceremony outdoors. McKinlock Court event space is also an option to move your guests outside for an alfresco cocktail reception. The Griffin Court was added in 2009 to the Art Institute and offers a contemporary architecturally designed, large and spacious modern room for weddings. Griffin Court is one of the most sought-after special events space within the Art Institute. Metal and glass, clean lines and Guests enter through the art museum’s impressive front doors of Modern Wing. The Prizker Garden is a private oasis adjacent to the Griffin Court separated only by a floor-to-ceiling glass wall. Ceremony, cocktail hour to reception, events are held in all spaces and Chicago weddings and photography can flow from inside into the outdoors into the open terrace and serene garden attached. Terzo Piano is a clean, modern space of fresh design. With its spectacular location on the third level of the Modern Wing, Terzo Piano offers panoramic views of Lake Michigan and Chicago’s skyline. A light-filled space with floor-to-ceiling windows, Terzo Piano offers a pristine blank canvas for you to create your perfect event. This versatile space may be combined with gallery viewing for flowing receptions into the thousands. The outdoor Bluhm Family Terrace is on the third level of the Modern Wing just outside Terzo Piano. It also offers stunning views of the Chicago skyline and Millennium Park. The terrace is shaded just enough for guests to experience the event as if you’re outside, but you won’t have to brave the elements. The Bluhm Family Terrace is the perfect complement to Terzo Piano. Combining the two special event spaces creates a magical setting for evening receptions and seated dinners. Take in the skyline views from Bluhm Terrace or choose wedding photos on the Nichols Bridgeway floating walkway pedestrian bridge which offer unobstructed, panoramic views of Chicago’s north facing skyline. Smaller, intimate gatherings take place on the second floor of the Modern Wing in the Nicholas Board of Trustees suite with its wall-to-wall, floor-to-ceiling windows facing Millennium Park, the Frank Gehry Pritzker Pavilion, and Chicago’s northern skyline, it’s a popular choice which offers memorable Chicago’s skyline views of the city lights and greenery of Lurie gardens and Millennium Park below. Impressive Chicago skyline views are from the Nichols Bridgeway, the pedestrian bridge located off of the museum’s Modern Wing. If you would love to showcase Chicago’s skyline to your guests, many of the Modern Wing’s event spaces feature views of the Chicago skyline. Take in the views through wall-to-wall, floor-to-ceiling windows facing Millennium Park, the Frank Gehry Pritzker Pavilion, and Chicago’s northern skyline, with a dazzling view of the Chicago skyline’s city’s lights and greenery of the Millennium parks and gardens below. 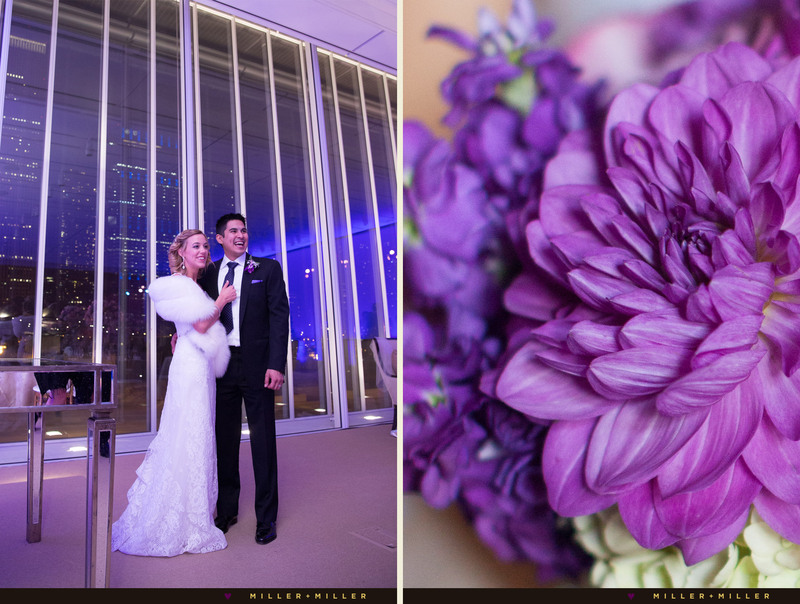 Contact Miller + Miller Wedding Photography if you’ve chosen the Art Institute of Chicago or the Modern Wing to host your wedding. 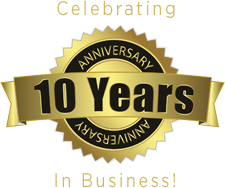 Call us 630-373-2411 or send us an email to discuss your wedding and the photography plans for your day. Are you going for a nature and garden inspired wedding day and photography as your preference? 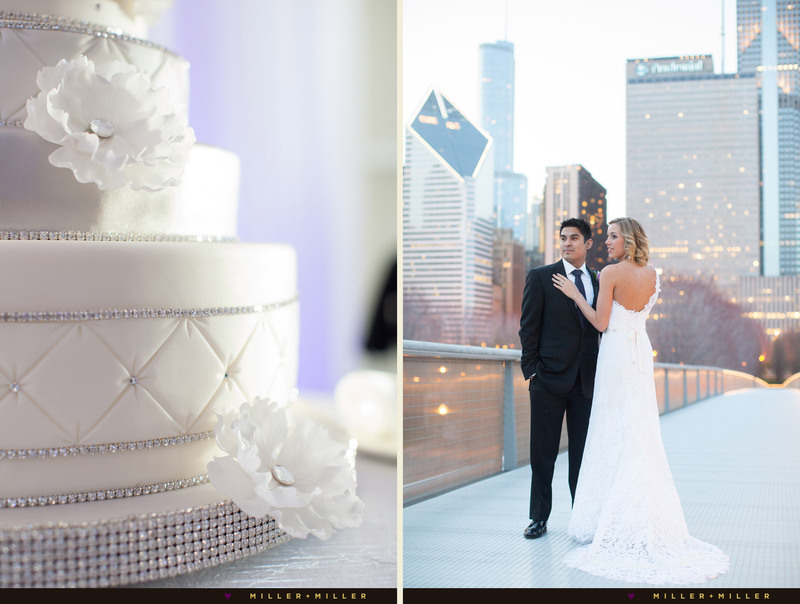 Or a Chicago skyline backdrop for your ceremony, reception or wedding photos fits your style? Both are located at the Chicago Art Institute and Modern Wing.